Conversations & Connections was held at the Johns Hopkins campus in Washington, D.C. on April 5, 2008, and it was the second annual conference for writers, experienced and not. The morning came too early for me after the reading down in Rockville, Md., the night before because it was at night, and I get up early for work. Let’s just say I was exhausted on Friday night, but still stayed up to check out what poems I should bring to the conference for the speed-dating session with an editor of a literary journal. Anyway, the sleep did not come easily because of nerves or my brain going over how the day would play out, etc. I’m not really sure. When the alarm finally went off, I shot out of bed and into the shower. And we–Anna and I–got ready in a flash to be dropped off at the Metro and head into D.C.
We were not going to make the 8:30 AM opening registration, but I wasn’t worried that we would miss anything. Registration went smoothly this time around, particularly since we ran right smack into Julie Wakeman-Lynn of the Potomac Review. She showed us the way into the basement. The coffee in the lounge area smelled burnt, so I decided to snag a bottle of water, which is funny considering somehow we ended up dehydrated. The opening statements were very short and to the point and we ran up the only flight of stairs in the entire building to the first floor from the basement to our first Breakout Session with Amy Holman. I heard her speak to a group last year about a similar topic though related to poetry. This session was better organized and helped show the writers in the room how to seek out the best literary journals for their work, whether it be poetry, fiction, or non-fiction. The separate notebook idea where you keep lists of your favorite authors and examine the publications where they appear helps. I think what I took away from the session more than anything was that I need to start checking journals and seeing what is consistent in their choices. Why are certain poems chosen, and what do those poems in each issue have in common with one another. The second session, “The Long Haul: Writing the Novel,” was in another building across the street so we had to get out and across the street quickly. We made the session in plenty of time and listened to novelists–Fred Leebron, Michael Kimball, and Carolyn Parkhurst. This session did not have anything eye-opening for me. The lunch break was to be shared with the speed dating sessions, so Anna and I decided to head out to lunch for the first hour because everyone appeared to be headed to speed dating for the first hour. We had our minds set on Chinese food, but could not find the place on the listing we got in the registration packet. We didn’t dare struggle to locate the Chipotle given the confusion we experienced in Dupont Circle. We settled on Bertucci’s and you will have to check out Anna’s description for the food. I want to tell you how wonderful the ice tea and the cappuccino was for me. The caffeine hit the right spot for me. I haven’t had a good cappuccino in forever. Speed dating went better than I expected. If anything it validated for me that I can tell when things are not working in my poems. I just have to be more confident in my abilities and fix the spots I know are wrong. The editorial staff of the Potomac Review must be well versed in analysis. I loved the ideas I received and the advice. Perhaps I will submit the poem I brought when it is finished. I haven’t decided. After speed dating, Anna and I met up with our former co-worker and friend, Gregg Mosson of Poems Against War. We are currently working with him on a review project that will showcase poets and essayists. I will keep you all posted on that once we launch it. We are still planning it out at this point and have to get some things in order first, but it should be a great new addition to my repertoire. The final session, “The Disciplined Writer,” again did not enlighten me too much. The stories of struggle were entertaining for the most part, but there really wasn’t any practical advice. I think that the general I don’t use an outline or I don’t plan out the novel before I start is very helpful because I think many writers are that way. I would have preferred to hear about what routines they tried to keep motivated and which worked and didn’t and why they didn’t or did work. I think the most I will remember from it in the future is the stories told about Joyce Carol Oates and how she locked the door quickly behind her guests and ran up to her writing room to begin work after a rather long dinner party. Another great anecdote was that Oates tells writers that they do not want to be like her because she has no life but writing. I don’t know about you, but I think I would enjoy being prolific like Oates, who is not prolific in the way some of those other writers are, like James Patterson and John Grisham. We left the conference chatty and giddy about the prospects we have for our writing now, so I think both of us will be on our way to becoming more productive. Wish us luck. The first round of my National Poetry Month contest ends tomorrow. 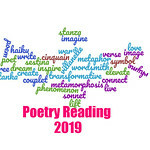 Please submit your poem entry (whether your own or one from a favorite poet) by the end of April 15th here. Thanks to all the participants.